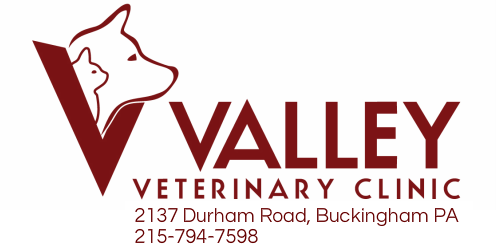 The Valley Veterinary Clinic is a full-service small animal veterinary hospital in Buckingham, Pennsylvania, that has been serving central Bucks County and the larger towns of Doylestown, New Hope, and Newtown since 1955. We provide progressive, quality veterinary care for companion animals in an intimate and friendly setting. We offer a fully computerized record system, complete in-house blood work capabilities, advanced surgical and anesthetic monitoring equipment, digital X-Rays, ultrasound capabilities, cryosurgery, and laser therapy for treating acute and chronic conditions. Pocket pets, chickens, and pot-bellied pigs seen by appointment. Grooming Services are available by appointment only (morning drop-off is available). In-Home Euthanasia Services are available by appointment on a limited basis.